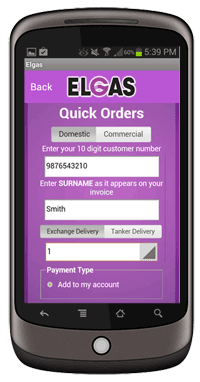 You can order, pay and manage your LPG with our Elgas EasyApp™. NEW: Quick Smart Gas™ App! Order Your LPG Quick Smart in Just One Second! While all of the pages of our web site are already fully compatible with mobiles and tablets, we know that many people just prefer the convenience of having an app on their smartphone. From M.W. 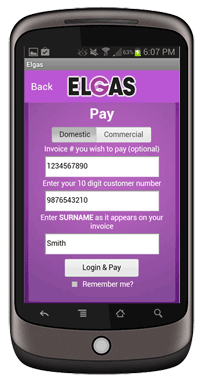 : Just wanted to let you know that of all my online accounts (phone, power, banking, shopping...the list could go on and on) elgas is the easiest and quickest to use by a long, long, long way. I can always locate the info or service I need in one or two clicks. Thanks Elgas! 1. Push “Domestic” or “Commercial”, depending on what type of account you have. 3. Domestic customers enter the last name that appears on your account. If you are a commercial customer, enter your password. 4. Push “Exchange Delivery” or “Tanker Delivery”, depending on how your gas is delivered. 5. If you are an Exchange customer, just select the number of exchange gas bottles you want from the “Quantity” box. 6. Click “Submit Order” and you’re done. 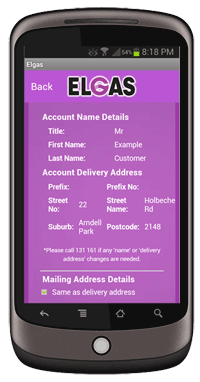 You can even have the app remember your details so your future orders will be even faster. The app uses a totally secure payment system that actually takes you to the Westpac payment portal to enter your credit card details. Only you and the bank ever see or have access to your credit card details. 4. Domestic customers enter the last name that appears on your account. If you are a commercial customer, enter your password. 5. Click “Login & Pay” and you will be transferred to the Westpac payment site to complete the payment with your credit card details. The app also has a drop down menu with all of the FAQ categories, so you can find answers right at your fingertips. There is also access to the CONTACT US page and an Elgas branch locator map tool. 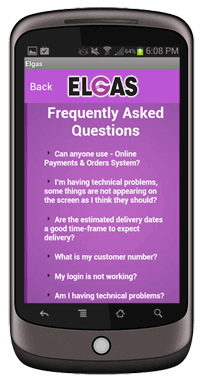 In addition, you can access the Elgas home page with all of its 600+ fully mobile compatible web pages, including our informative blogs. The app also gives you access to the online gas appliance store. You can shop for gas heaters, fireplaces, hot water heaters, BBQs, patio heaters and more.